Brad and family were out this past week and we found the fish around the docks as well as the trout bite getting ready to take off. Later in the week, I had Brad & Family, Dave & Matt, Greg, and Chris & Darren. The trout bite has improved, but the winds kept us from getting to some of the better spots to find some nice trout. We had fun in spite of windy days! As the sun warms up the water again, look for fish to travel into the shallows to feed. Trout will continue to be most prevalent in the deeper grass flats in two to four feet of water. Those anglers using live shrimp on popping corks, Deadly Combos, CAL jerk baits and top water will have the best chance at hooking up with a trout. I like to fish the edges of the shallows where the water drops off to these depths. You can find some trout on the flats early, but they tend to go deeper after sunup. Depending on weather conditions, there are many areas to fish. Round Island, Bear Point and Harbor Branch are always popular to fish in March. Redfish will get more active this month and you can find some tailing on the flats in early mornings. Top water, DOA shrimp, CAL grub tails or gold spoons are good choices for finding a spot tail on the flats. Don't forget to fish around the mangroves also. So far this winter, there has continued to be a good redfish population around the river and the fishing has been good for them. 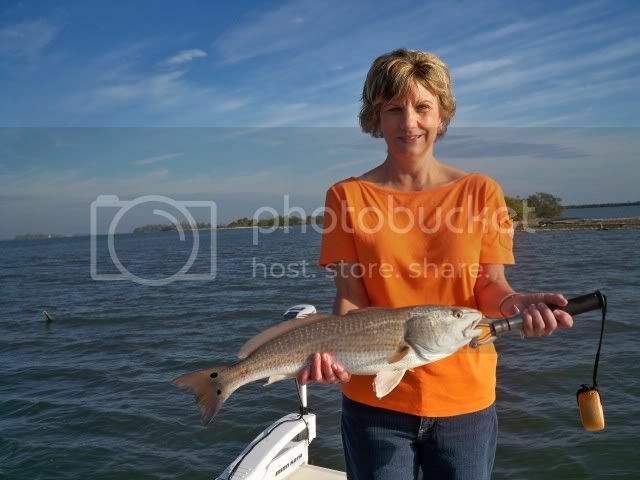 I tend to like the east side of the river for redfish, but you can find them on the west side also. Work your baits slowly along the bottom for best results. Learn to read the water so you don’t miss what is happening around you. Anglers will continue to target snook around the inlets, docks and bridges on the Treasure Coast. Live bait always works best, but feather jigs, TerrorEyz and BFL lures can also get you hooked up. Most of the action will be at night with best results on the high ends of the tides. As the water warms up around the area, the snook action will liven up also. Those fishing the flats can also find snook feeding early or late in the day. Fish the mangroves during the rest of the day. Top water, twitch baits, TerrorEyz or CAL jerk baits can do the trick in March on the flats. The pompano bite has been better this year. 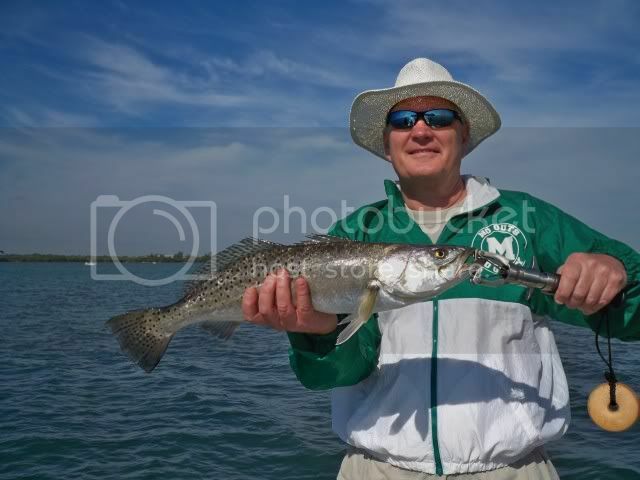 More fish have been caught south of Fort Pierce and they should be around this area throughout March. Whiting, Bluefish and pompano will be hanging around the beaches this month. The inlet will be holding Spanish mackerel, jacks and bluefish. Jack Crevalle and ladyfish continue to haunt the river and provide fun catch for all. Bridges should give up catches of sand perch, Sheephead and black drum on live or dead shrimp. A couple photos from this windy week! Warm spring weather has made for enjoyable outings all around the Treasure Coast. While the air was warm, the water temperatures continue to struggle towards warmer conditions. The bite slowed somewhat later in the week, but you could still catch sheephead around the docks. Our redfish bite slowed a little, but we were still able to catch a few in spite of cold water. We had some fun out there with sheephead, redfish and a variety of other fish to keep us busy. Duncan Haley was in the area and we spent some time remembering high school days and catching up on the years. Only one redfish that day, but it was nice to see him again. 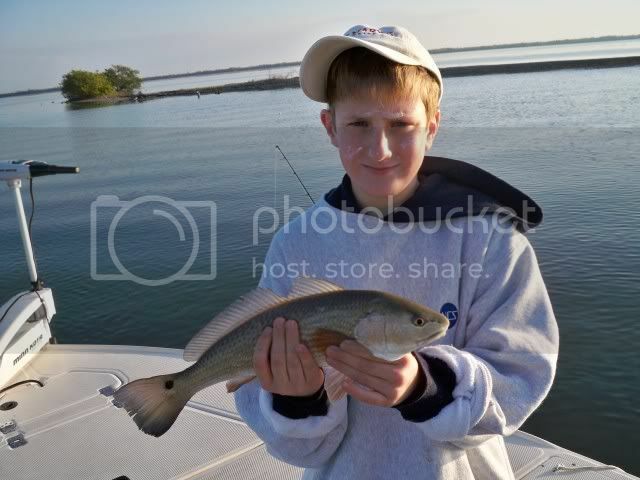 Brad's son was out with him and his grandfather, Gary and caught two redfish on his first two casts. 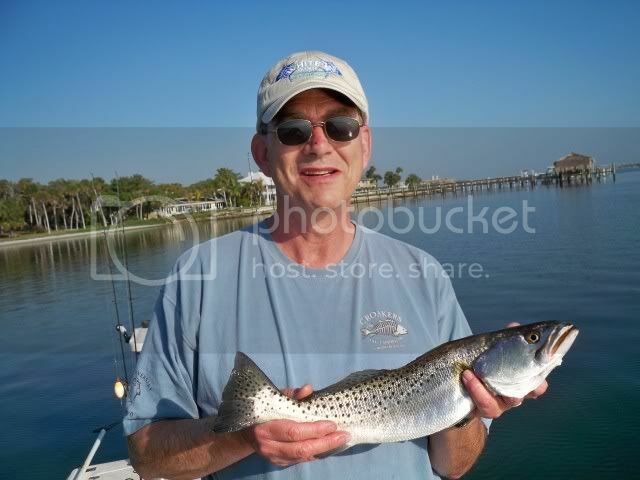 Tom and Becky caught a variety of fish on their trip around the Indian River. To finish off the week, I spent a couple days in Sebastian with my buddy, Pat Wells and son, Dalton, on a camping trip on the islands. The water is very cold up that direction, so we ventured into the Sebastian River to find more ladyfish and jacks than Dalton could handle. On a windy day, we stayed out of it and enjoyed some fun fishing that day. Trout should begin to bite very soon. We are just waiting on the temps to rise a few more degrees and the river should become alive with fish. CAL jerk baits always work well when trout fishing. Most of the action has been around bridges and docks with sheephead, bluefish and a good variety of others. Our redfish has been mostly around the dropoffs of some of the flats. Live baits and CAL jerk baits have worked best. It's still a transition period on the river and as temperatures continue to improve, so will the bite. Spring is almost here! Winter is gradually losing it grip on the Treasure Coast. Still some cold fronts to deal with, but they have only been bringing a few nights in the 40's and the days have been quite sunny and warm. You can expect that the winds will still be blowing, but we will have plenty of days to get out fishing! I had Evelyn, Mike and James on the boat this past week. We found a good early bite that slowed once the latest front worked its way into the area. They caught some big fish that day and we enjoyed being out on the river. 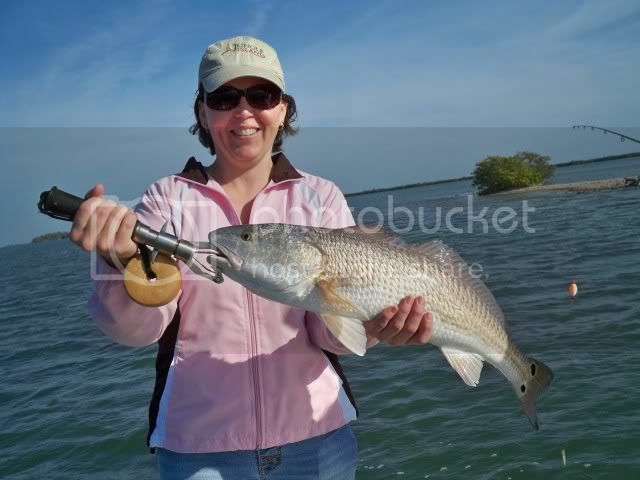 James boated a nice 27" redfish to top off his day, while Evelyn caught a 25" redfish and a 28" fat gator trout. It certainly gave her a battle that she will remember! 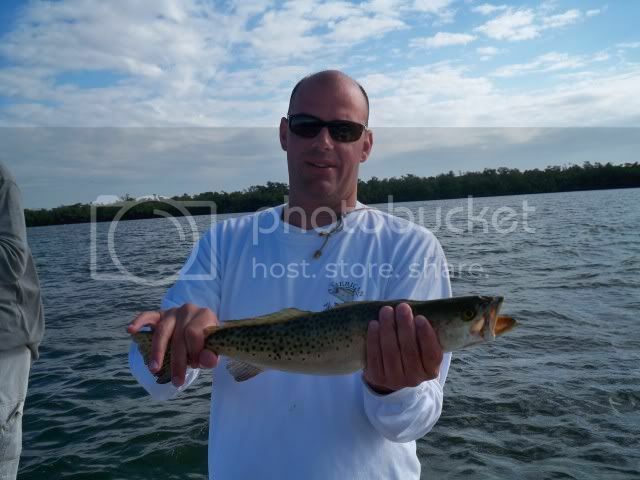 Trout have been feeding out there if you can find any warmer water or bait around the flats. We have been fishing those types of areas and having success. Live baits, CAL jerk baits and Deadly Combos are on the top of my list when it comes to trout. 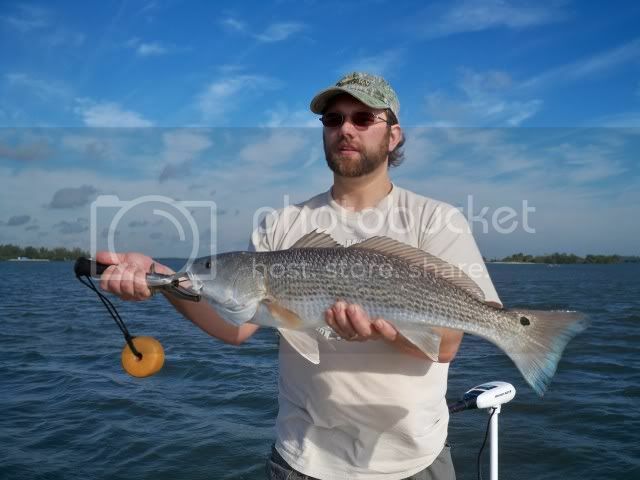 We have found our redfish in similar areas and willing to hit the same lures. The reds have been much more willing to bite than trout lately. The docks and bridges have held lots of sheephead this month. Live or dead shrimp continue to produce fish. The inlet and turning basin have held bluefish, jacks and mackerel. The best action has been around the jetties. I had several good reports of flounder around the sand flats and back side of the jetties. The surf has been producing whiting and pompano. Most of the pompano action has been south until the water temperatures warm up to bring them farther north. Clams, sand fleas and shrimp have worked well along with Doc's Goofy Jigs. It can be a challenge with the windy days, but there are plenty of place to fish if you use the winds to your advantage. Getting out early is one way to get in some great fishing time before the winds set in for the day. Have fun and enjoy the fishing! Evelyn and James with their big fish of the day! It was a fantastic week around the Treasure Coast. Both weather and fishing cooperated to make for some great fun out on the water. Warm days in the 80's can make you forget that it is still wintertime around the area. Hopefully it stays that way for a while! I had Ron, Mike and Timberly out this week and we found the fish were hungry and feeding around the edges of the flats. They teamed up for a dozen redfish, some nice trout and a lot of other fish to round out their day. Ron landed a 25" trout to top off his catch, while Mike caught a 22" redfish and Timberly had a battle to land her 25" red. We had a lot of fun out there on the Indian River! The water continues to warm up and so are the fish. Warm water and baitfish can only mean that the predators are nearby. Fish around bait when you see it and you should have some success. Trout and redfish have been the best action around the flats. Fishing in two to five feet of water with Deadly Combos, live shrimp and CAL jerk baits can help you find where the fish are feeding. You should find trout on most flats by now. Drift fishing across the flats can speed up finding where the fish are feeding on any given day. 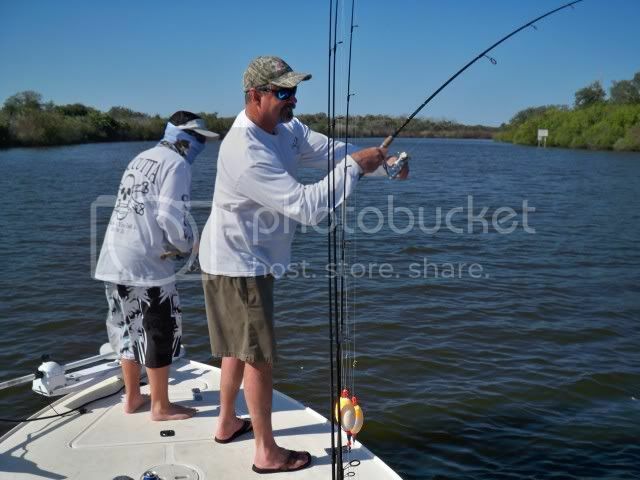 Snook fishing should begin to pick up soon as the water warms up to their liking. We should also see the big jacks invading the river. There are still some flounder being taken on the back side of the jetties and all the bluefish and mackerel you can handle around the mouth of the inlet. The turning basin in Fort Pierce has also been full of blues and jacks. Shiny lures or shrimp on jig heads can get you in on the action. The tackle shops have been having a run on silver spoons this month! The sheephead and black drum have been all over the river. Fish the docks, bridges and structure to find some big sheephead this time of year. Live or dead shrimp can get you in on the bite. The surf has been good for whiting and blues with most of the pompano action being to the south of Fort Pierce. Try walking along the beach with a top water lure at first light and see what you can catch! February has already been a good month and it has just started. 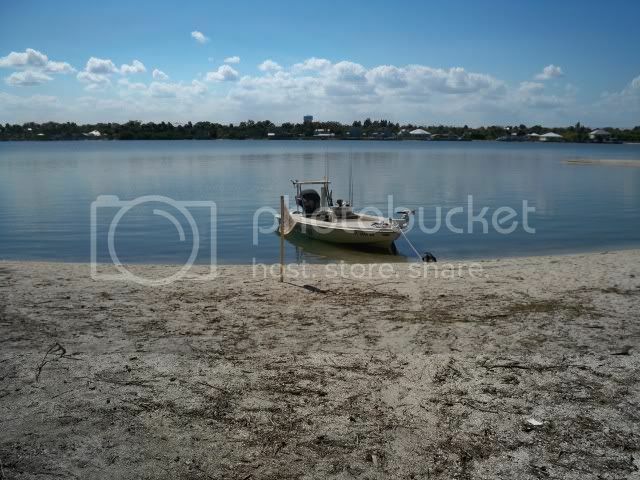 Get out soon and enjoy the weather and the fishing! 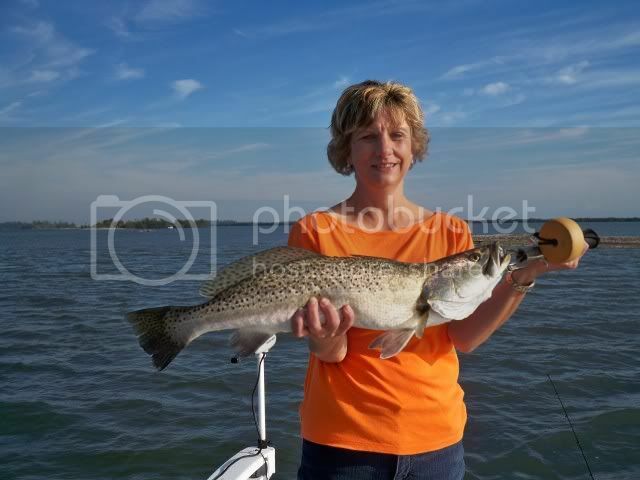 Timberly with her 25" redfish and Ron with a 25" trout.